Bamboo charcoal producers in Ghana use the chainsaws provided by GBPL to cross-cut bamboo for carbonization. 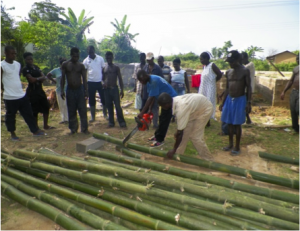 In Ghana, support from a local business, Global Bamboo Product Limited (GBPL), is helping the INBAR project, ‘’Bamboo as sustainable biomass energy: A suitable alternative for firewood and charcoal production in Africa’’ guarantee the sustainability of project activities beyond its funding period. 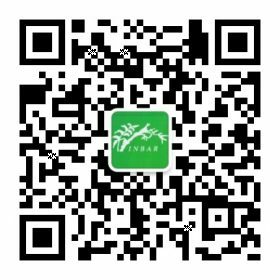 The four-year INBAR project, currently in its final year, is introducing bamboo charcoal to rural communities in Africa as an alternative to timber charcoal. Through the initiative, bamboo charcoal technology has been transferred from Asia to Africa, communities are benefiting from training and capacity building in sustainable management of bamboo resources, and bamboo charcoal Micro and Small Enterprises (MSEs) have been established and are on the grow. Prior to receiving support from GBPL, bamboo charcoal producers at the two project sites in Ghana, Ellembelle and Mpohoor Wassa District Assemblies in the Western Region of Ghana, had to rely on machetes to harvest bamboo from the natural forest, and could only harvest a limited number of bamboo culms per day. The bamboo charcoal production capacity of the MSEs was about 20 percent short of the expected supply of charcoal to the market traders and to GBPL. Addressing this need GBPL—a local company in Ghana specializing in the markets for and marketing of bamboo products – provided the bamboo charcoal MSEs trained through the INBAR initiative with chainsaws used to harvest bamboo for charcoal production through an interest-free loan. The chainsaws have become a crucial tool in harvesting bamboo on a large scale for bamboo charcoal production. Since the provision of the machines in May 2012, production of bamboo charcoal by the MSEs has already increased by about 60 percent, as of December 2012. INBAR together with partners, the Bamboo and Rattan Development Programme (BARADEP) and the Forestry Research Institute of Ghana (FORIG), is encouraging more involvement by the private sector in the production of charcoal in Ghana to help reduce deforestation and environmental problems associated with wood charcoal production.